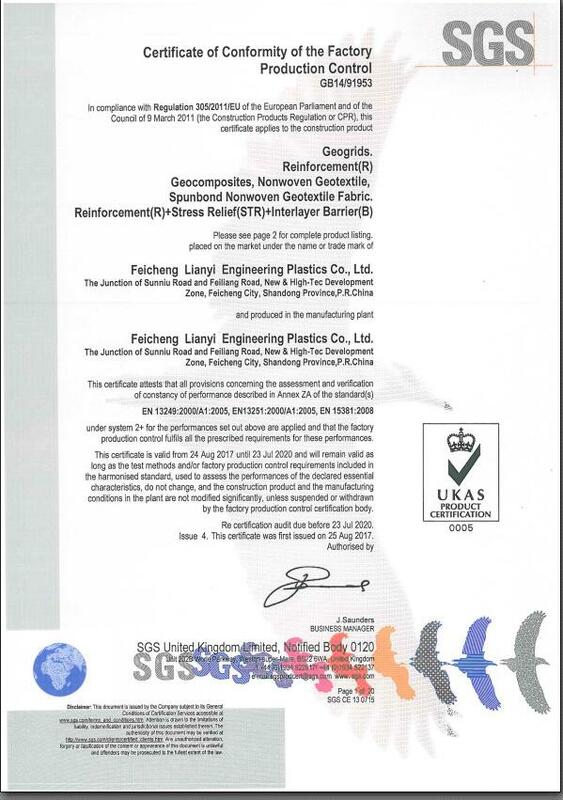 Company Overview - Feicheng Lianyi Engineering Plastics Co., Ltd.
11YRSFeicheng Lianyi Engineering Plastics Co., Ltd.
Feicheng Lianyi Engineering Plastics Co., Ltd. is a comprehensive enterprise. 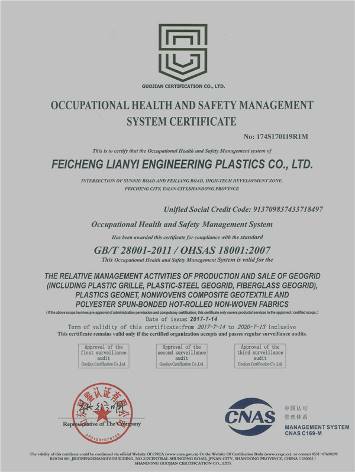 Our business scope covers scientific research, development, manufacturing and sales of geosynthetic, plastic and fiberglass products.At present, our company owns fixed assets of RMB800 million, with 581 staff members, 48 percent of who are graduated from domestic universities. We also have established long-term cooperation relationships with several research institutes, universities and designing institutes. 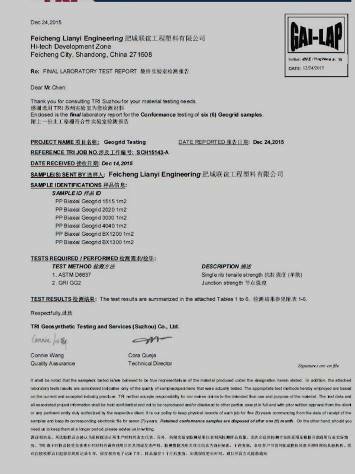 Our technical capability is very abundant. 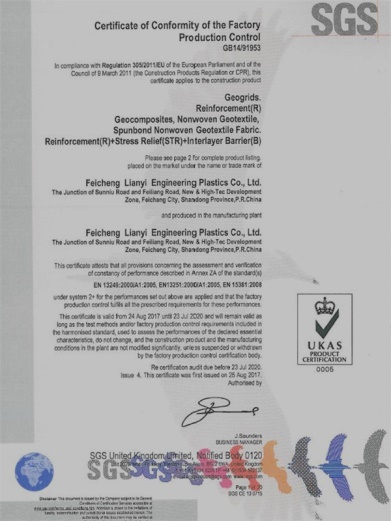 Our annual output is about 150000 tons.Our leading products are chopped strand mats, E-glass chopped strand mats, C-glass chopped strand mats, fiberglass geogrids, polyester gegorids, geogrids, geonets, geocells, safety fences, warp-knitted geogrids, steel welded geogrids and geo-mattress. 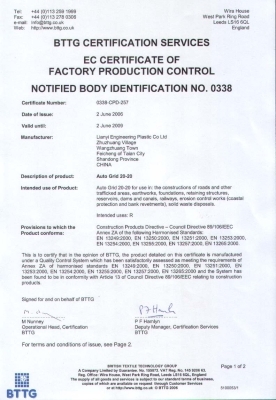 They have been widely used in the fields of highway, railway, reservoir, airport and mine. 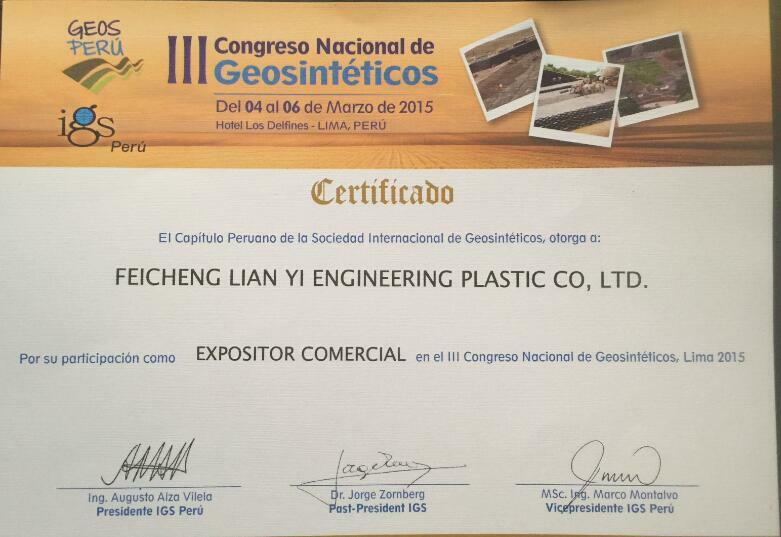 Our company is also one of the earliest members of China Geosynthetic Material Engineering Institute. 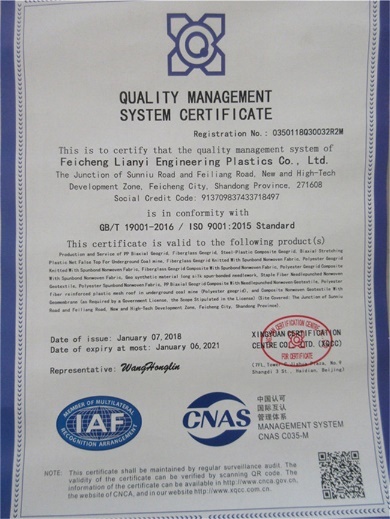 We have obtained ISO9001 and CE certificates, and some products have passed SGI test.Now our products have been sold to many countries and areas, such as Korea, Israel, Kuwait, Thailand, Canada, Panama, and Taiwan area, winning a good reputation.Providing high quality and perfect service for consumers is our management theory. Keep innovating and constantly improving our products is our developing policy. We are looking forward to establishing long-term cooperation relationship with you. Production and service of PP biaxial geogrid, fiberglass geogrid, steel-plastic composite geogrid, biaxial stretching plastic net false top for underground coal mine. Fiberglass geogrid knitted with spunbond nonwoven fabric, polyester geogrid knitted with spunbond nonwoven fabric. Fiberglass geogrid composite with spunbond nonwoven fabric, polyester geogrid composite with spunbond nonwoven fabric. Geo synthetic material long silk spun-bonded needle work, staple fiber needle punched nonwoven geotextile. 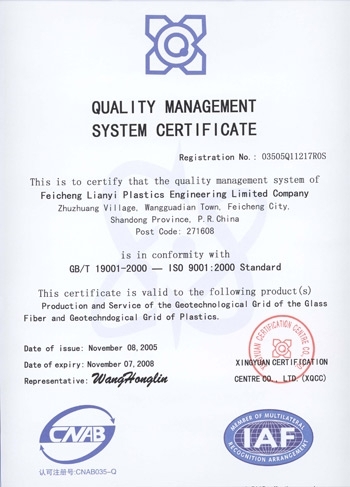 Polyester spunbond nonwoven fabric, PP biaxial geogrid composite with needle punched nonwoven geotextile, polyester fiber reinforced plastic mesh roof in underground coal mine (polyester geogrid), and composite nonwoven geotextile with geomembrane (as required by a government license, the scope stipulated in the license) (site covered: the Junction of Sunniu Road and Feiliang Road, New and High-Tech Development Zone, Feicheng City, Shandong Province ).